Brutal-looking game yesterday in Dallas, as the Lions went mono-grey against the Cowboys. Obviously, the Lions’ mono-grey look would look brutal against any opponent (or just by itself), but it was particularly bad against a team wearing white over silver-blue. What a mess. More photos here, if you dare. • Another helmet switcheroo for Pats quarterback Tom Brady. Last week he swapped out his new Riddell SpeedFlex for his older Riddell lid, but yesterday he went back to the SpeedFlex. • Dirty Laundry Day in Arizona, where the Seahawks wore their mono-grey alternates. In case you’re wondering (as I was), Exum’s bumper logo was present and accounted for last week. But it was missing the week before that! And it was not missing the week before that!! Hmmmmm. 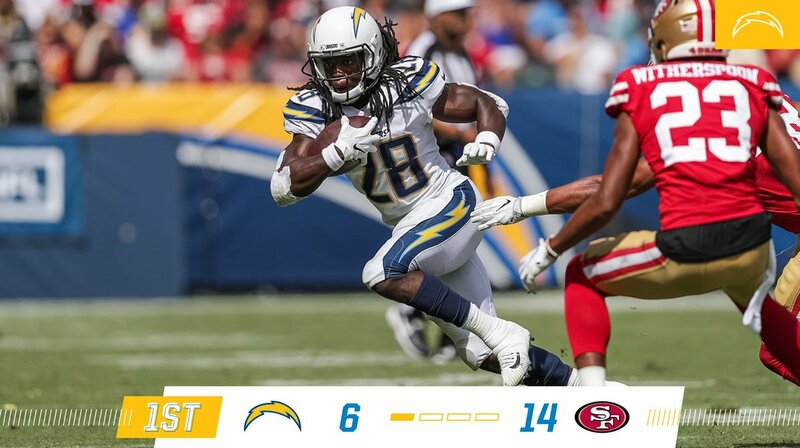 • Four teams wore white at home: the Jags, Chargers, Titans, and, of course, the aforementioned Cowboys. • Several Dolphins players continued to protest during the national anthem. Octung, baby: Today is the first day of October, and I for one couldn’t be happier. This has always been my favorite month — the changing of the leaves, a little nip in the air, the rediscovery of sweaters and other wool clothing, the World Series. It all feels Just Right. Oct. 4: I’ll be seeing the great Australian band the Moles, with Guided by Voices guitarist Doug Gillard opening for them. That’s some A-list talent right there. Oct. 12: I’ll be seeing the Scientists, a super-important Australian punk band who’ve been playing since the late 1970s but are just now doing their first U.S. tour. Very stoked for this. Show has been cancelled. Dang. Oct. 13: I’ll be seeing one of my all-time favorite bands, the Feelies, who are doing a special set of Velvet Underground covers. Should be fantastic. Oct. 14: Pickle Day! ’Nuff said. Oct. 15-16: For these two days, I’ll be attending the taping of the Puppy Bowl and its Kitten Halftime Show. Big shout-out to Animal Planet for once again inviting me! Oct. 20: Jon Springer, who runs the tremendous Mets by the Numbers site, is having us over for a pig roast. This will be three years, almost to the day, since the last pig roast we attended at his place. That one was a hoot, and I’m expecting this one to be the same. Jon says this one will be “German-style.” Öink! Oct. 22: My friends Julie, Kris, and Lydia will be hosting their annual music trivia contest to benefit cancer research. I was part of the winning team two or three years ago, and I think my team came in second place last year. Always a fun time for a good cause. Oct. 23: The great comic artist and illustrator Michael Kupperman will be doing a presentation about the book he wrote about his child-genius father. This is part of a Tuesday-night series of presentations I often attend at the Parsons School of Design, which are almost always excellent. Oct. 26: For years I’ve been attending the annual Food Film Festival, where they show short food-centric movies and feed you the food that you’re seeing onscreen in real time (which sounds chaotic but actually works surprisingly well). It’s always a great time, and on this night I’ll be viewing/eating a program devoted to foods of New York. Oct. 27: The Tugboat Captain’s brother and sis-in-law will be in town to join us at The Velvet Underground Experience, a multimedia exhibit devoted to the Velvets. Then, later on, I’ll be going back to the Food Film Fest for a barbecue-themed program. What a day! Not too shabby, right? Of course, attending all of these events will mean missing a lot of football games, MLB postseason games, and even World Series games. But there’s more to life than the latest ballgame, and all this stuff makes me appreciate how lucky I am to live in NYC. Here’s to October! Footwear alert: My friend Mac says he was told by a clerk at the Converse flagship store in Manhattan that the company is phasing out its “natural white” color option (aka off-white, vintage white, cream, etc.). Sure enough, if you look for that color on the major online shopping sites, most sizes are sold out. So if you’re a Chucks fan and are partial to that color (as I am, at least in the summer), I strongly suggest that you stock up on a few extra pairs — if you can find them in your size. I poked around on eBay last night and found a new pair of natural white low-tops in my size for only $14 plus shipping, so all is not lost — at least not yet. Baseball News: The last weekend of the regular season left us with one more blue-vs.-blue matchup between the Rays and Blue Jays (from Brian Hattab). … Mets P Noah Syndergaard broke his bat while swinging without hitting the ball. 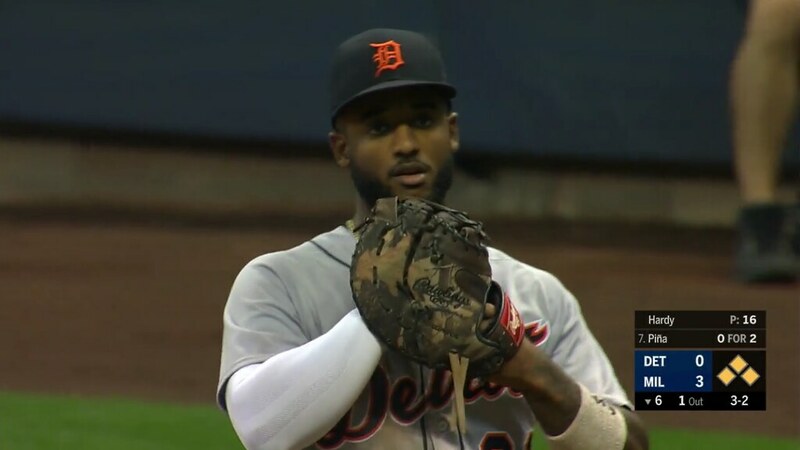 … Tigers 1B Niko Goodrum uses a camouflage glove (from Mike Chamernik). 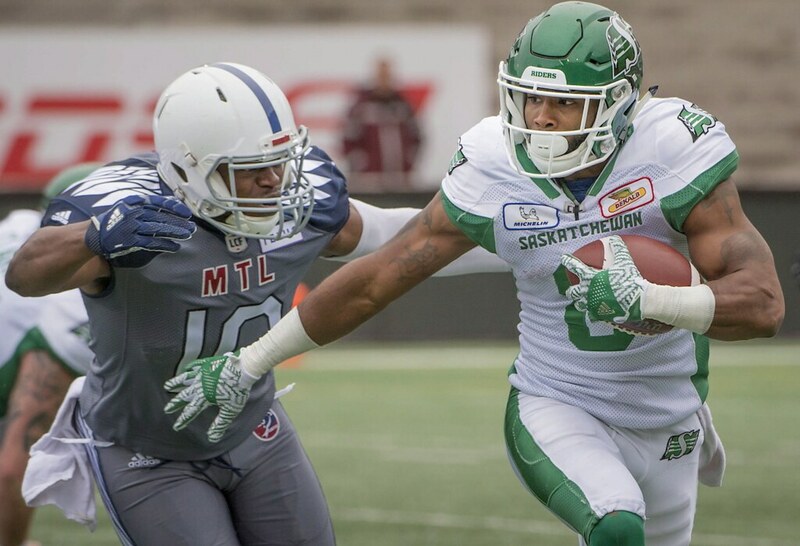 Football News: The CFL’s Montréal Alouettes wore their grey alternate uniforms for what Wade Heidt thinks is the only time this season. However, the uniforms featured a new white helmet that was blank on one side and had a number on the other. … D-II Colorado School of Mines wore helmet stickers for It’s On Us, a campaign to stop sexual assault on college campuses (from Reggie Golden). Hockey News: A Panthers social media post reveals that the team may have camouflage and Hockey Fights Cancer warmup jerseys this season (from Danny Lopez). … Vancouver Giants (WHL) G David Tendeck has a new mask (from Wade Heidt). 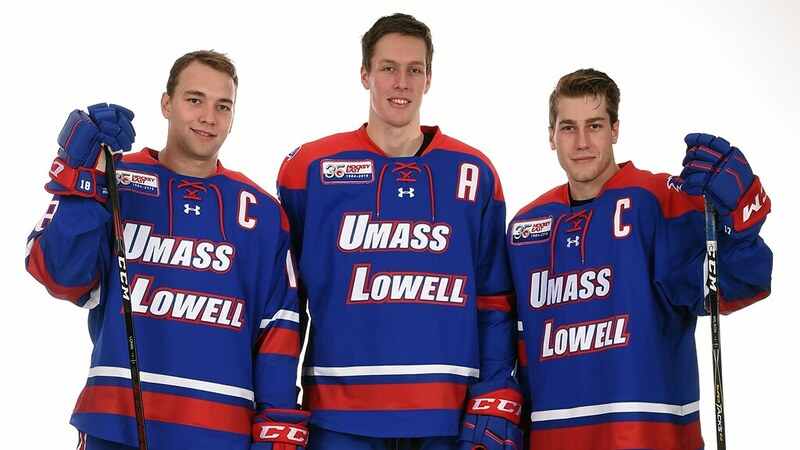 … New jerseys for the NCAA’s UMass Lowell, including a 35th-anniversary patch for Hockey East, and new jerseys also for Mercyhurst. If you think Mercyhurst’s jerseys are Whalers-esque, that seems like the idea. … The Flyers’ new mascot, Gritty, inspired a fan to bake these cookies (from Jack Wade). … Here’s a look at how the team name for a prospective NHL franchise in Seattle is being chosen (from a reader who didn’t give his name). Basketball News: The Cavaliers hosted an intrasquad scrimmage at Wright-Patterson Air Force Base in Dayton and continued the military theme by wearing camouflage-logo warmup shirts (from John Bedell). Soccer News: New third kit for English Championship team Middlesbrough. … Bayern Munich fans have been loudly protesting their team’s kit for this season, which is red/blue/red. The protesters want written into the club constitution that the kit, not just the club colors, is to be red and white. 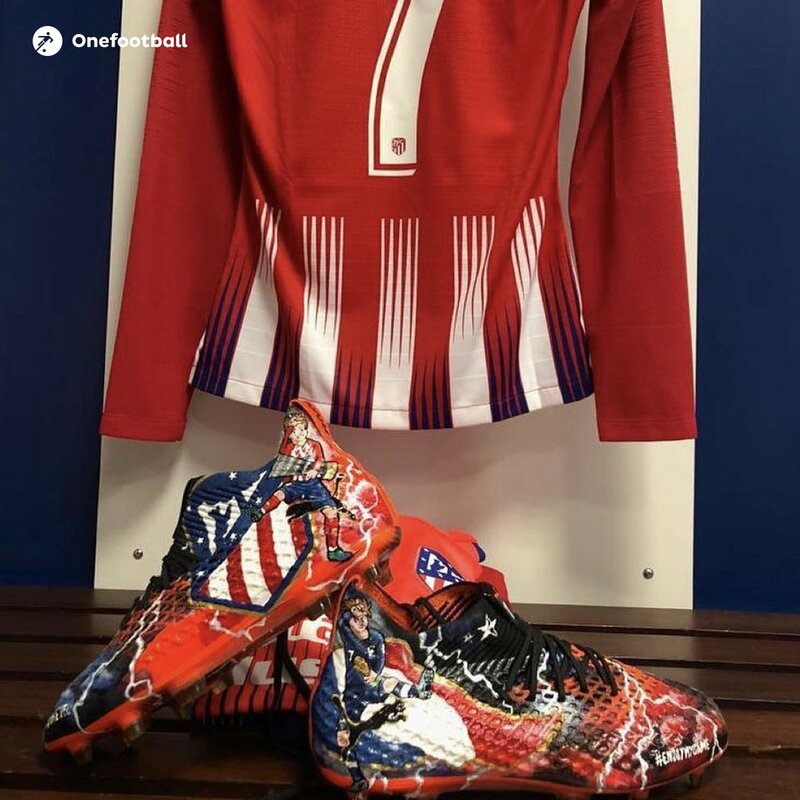 … Atlético Madrid winger Antoine Griezmann wore very elaborate custom boots, featuring him in uniform for both Atlético and France, for Saturday’s Madrid derby with Real Madrid (from Josh Hinton). … Blue-vs.-blue in the English women’s top tier between Birmingham City and Manchester City. … Scottish Championship team Dunfermline Athletic have worn special red shirts three times so far this season. The shirts commemorate the actions of a group of seven World War I soldiers, the leader of whom was a lifelong Dunfermline fan, in September 1918. Wasn’t it 3 teams white at home. The cowboys did their usual white over silvery/blue/gray at home. Oh — somehow I had it in my head that the Cowboys/Lions game was played in Detroit. Will fix! The Titans wore white at home as well. Dang — again, I somehow assumed that game was in Philly. Will fix! The Feelies are the best! Enjoy. I think I still prefer the 60s style red helmet with the black jersey. There is a real lack of red helmets in the NFL. Just the Chiefs in the 32 team league. Would be nice to see another red helmet and the Falcons have a tradition with them. Something they should consider for the next uniform design, which promptly needs to happen to fix what they have now. Yep. Bills should go back to the red helmet. And Falcons should also go red helmet and black jersey. I guess it’s because I’m too young to have grown up watching the Falcons in red helmets and black jerseys, but I really don’t think that is a good look. I much prefer the black helmet and black jerseys of the 90s. 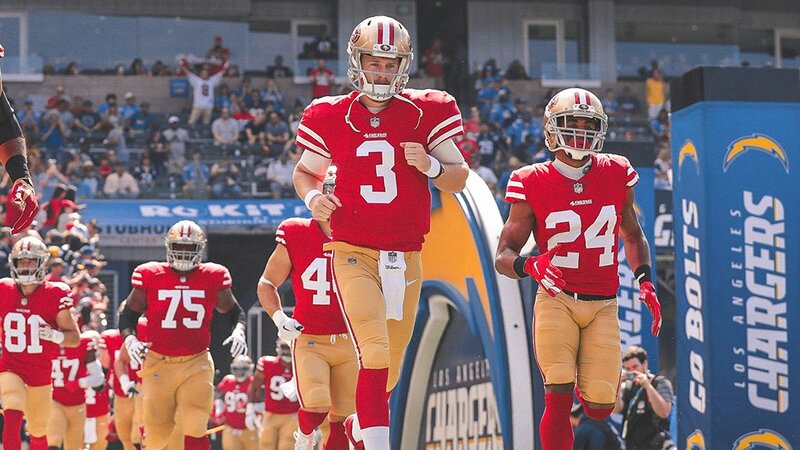 I realize that there are already several teams with black helmets, who all wear black jerseys at least occasionally (Jaguars, Ravens, Steelers), so my second choice would be the red helmets and red jerseys of the 70s and 80s. The age I am makes me long for the red/red/silver look of the late 70’s, early 80’s. I really liked that look for them. Yes, they should go back to the red helmets…I hated it when the Glanville’d it in the 90s and I hate it now. Hate being that guy but the Tigers player in the Ticker spells his name ‘Niko’. Shame about the Chucks. I haven’t had a pair in many years but those were what I wore daily as a kid. Fond memories. Never apologize for pointing out an error. There are no “picky” corrections — there’s just correct and incorrect, and I want the site to be correct. Saw a new play last week in NYC, called: “The Lifespan of a Fact.” Very good cast, including Cherry Jones, Bobby Cannavale, and Daniel Radcliffe, tells the true story about the fact-checking process of an essay by John D’Agata in 2003. Interesting topic, but maybe the script lacks a little teeth. Maybe you’ll get a chance to see it. Surprised the Lions / Cowboys uniform matchup was allowed. I don’t remember seeing a team wearing white against the Seahawks or Patriots when they have trotted out the ugly alt gray/silver jerseys. And especially in the case of the Cowboys uniforms. The NFL paid attention when color blind folks had problem with a red/green match up, you are telling me they didn’t think there would be problems telling the teams apart in that Lions / Cowboys game? 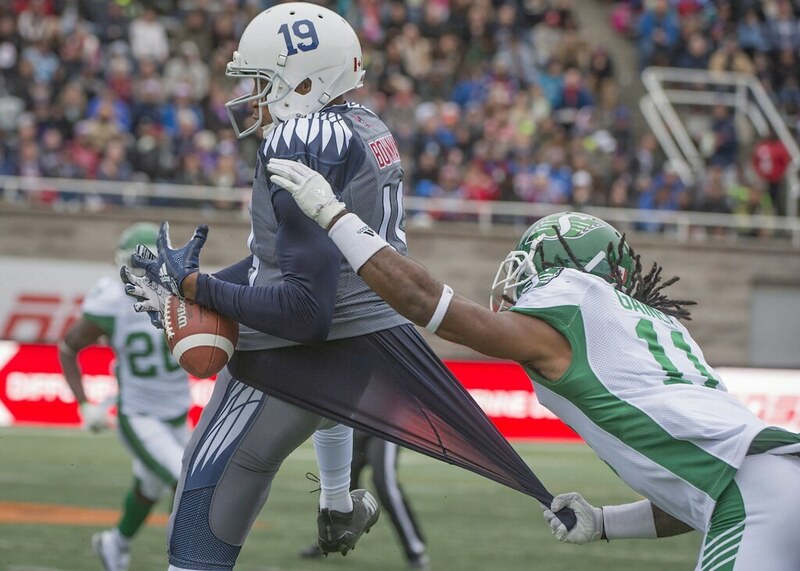 Yeah, those uniforms should really be designated as whites (well, “lights”). They’re pretty bad-looking unis anyway, but at least then there would be some contrast, and they wouldn’t ruin the aesthetics of the game to the same extent. 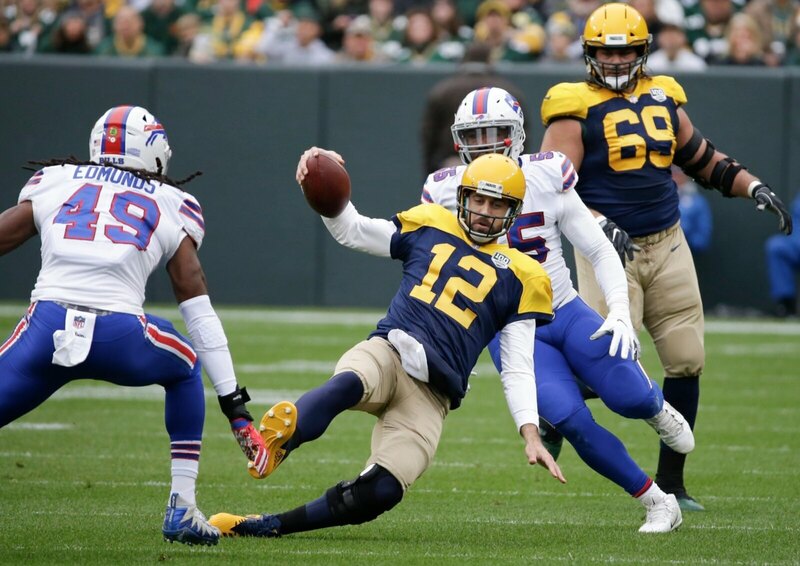 The Lion-Cowboy debacle has to be the worst looking matchup in NFL history (not counting throwbacks). It looked like a NCAA division II game, not an NFL contest. Bulls wore white for their preseason home opener last night, after wearing predominately red at home last season. The Lions/Cowboys matchup had 4 different types of grey/silver on the field. More like metallic blue-green for the Cowboys’ pants. Those Saints jerseys look fantastic. Pair them with gold pants and repaint the helmets to match that darker shade of gold….and that look is a keeper in my books. And change the white helmet stripe to the new gold – need to keep patterns in sync. Jerseys and pants, top notch. The lack of proper socks prevents this uniform from being an A+! NO, NO, NO Gold pants with those. Those look best in crisp, clean whites! Ugh, why must everyone insist that if the jersey is white, the pants must be a color??? RIDICULOUS! The Saints looked fabulous yesterday! PERIOD! I would have figured Paul Menard to be a proud Blugold supporter, since he went to school at UW-Eau Claire (as did many of his relatives, including his father) and he grew up a stones-through away from the campus. There was a blue vs blue matchup in KC as well. Hey Paul, the off white converse have been my shoe since the ’80s. They discontinued them at least one other time before this. For what that’s worth. I’m still gonna snag me a pair or two. As a Lions fan, I hated it when they went mono-blue against the Jets and I really hated this mono-gray look. Blue tops, silver/gray pants at home. White tops, blue pants on the road. Done and done! NO, NO, NO BLUE PANTS! Silver pants only, please! I HATE, HATE, HATE dark hue pants!!! Totally awful look! Absolutely in agreement! Silver pants only for the Lions! Yes again to silver pants only! Didn’t like the blue pants in 1998, and not a fan of them now. I wonder at what point the greatest number of NFL games were played on baseball infields. Seemed like it would have been sometime around 1965, when the Browns, Giants, Cardinals, Colts, Bears, 49ers, Vikings, Lions, Jets, Patriots and Chiefs all had MLB roommates (and the Broncos had the minor league Denver Bears, whose season may not have overlapped much if at all). But in 1971, sixteen NFL teams shared facilities with baseball teams (the Senators having not yet left DC). I’m too lazy to check to see if that’s the record,but it might be. Eventually the Giants and Jets moved to Jersey and the Lions moved to Pontiac and the Colts moved to Indianapolis and we started building sport-specific stadiums rather than multipurpose ones. Thanks for the heads up and link about the Velvet Underground Experience. Kept catching half info about this on the Metro stations. Saints uniform against Giants looked great except for one thing: color break-up absent from socks which gives them the awful “color-rush-leotard” look. Many of these former color rush unis would look great with proper sockage (stripes/block color) including Giants tbacks. You’re probably right with 1971, but I count 17 teams which shared their home stadium with MLB clubs that year – Colts, Jets, Browns, Bengals, Steelers, Oilers, Chiefs, Raiders, Chargers, Redskins, Eagles, Cardinals, Giants, Vikings, Lions, 49ers and Falcons. To get the total number of games played with an infield, you will need to remember that the Packers used to play some of their games at Milwaukee County Stadium. In 1971, they played 3 of their games there. Are we considering only dirt infields? I thought the Bengals, Steelers, Oilers, Eagles, Cardinals and 49ers (Candlestick) had artificial turf covering the mound, home plate and sliding pits in 1971. Beat me to it. But according to wikipedia, at least the astrodome and riverfront had complete astroturf fields by 1971, so it would have been easy to cover the sliding pits/mound. Saints uniforms yesterday were just one element from being perfect. A matching gold helmet with the larger, throwback fleur de lis logo. 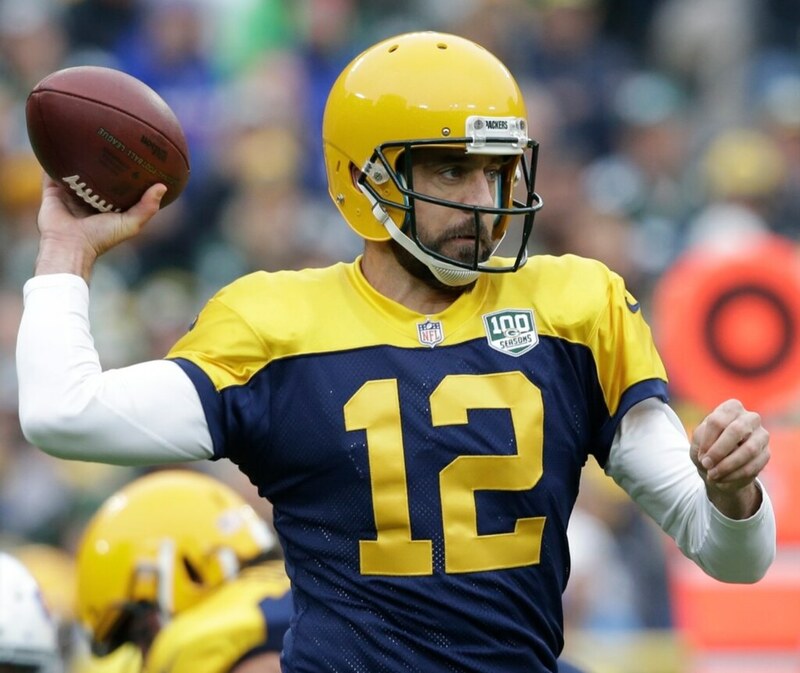 Those uniforms are [one of] the best in league history. BTW, October is my favorite month too! Can’t seem to find the link to your friends’ music trivia night on Oct 22. Can you provide any other info? How is Tom Brady allowed to keep switching helmets back and forth. Isn’t that against the one shell rule? P.S. Saints uniforms yesterday were awesomeness! Thanks Paul. I always thought it was a hard and fast rule with the exception of damaged helmets. In this era of billion $ palaces, there was something nostalgic, “school-yard like”, watching the game on an imperfect field. 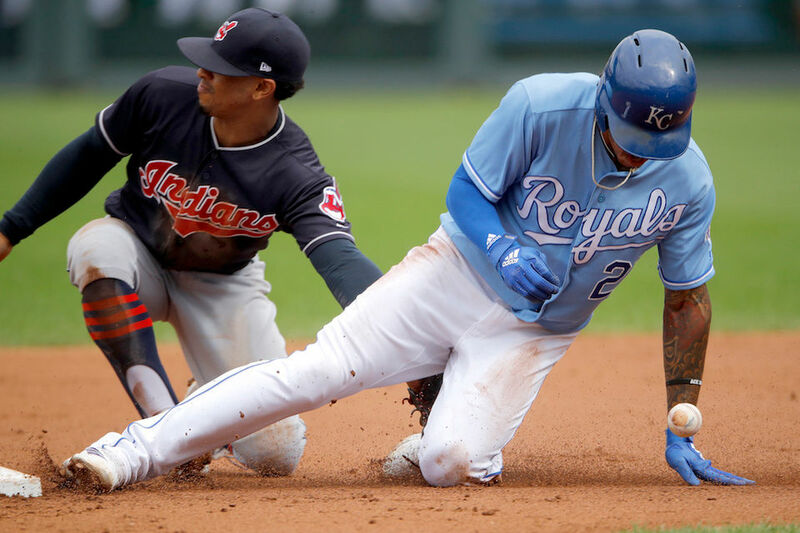 There was a spectacular, tip-toe, end zone catch, which was also on dirt – I guess the dirt close to the dug out, probably the last time such a spectacular catch happens on dirt. If Tom Brady has two different shells, isn’t that in violation of league rules? So what’s the difference between switching helmet makers and letting teams use more than one shell? Aren’t they both using new helmets? Tom Brady switching either a) violates the one helmet rule or b) shows that there is no danger in having more than one helmet. For throwback games just have everyone change helmet types for one game with the appropriate throwback color. Actually, all NHL teams had those same Camo and Cancer warm-up jerseys last season, as well as a St. Patrick’s Day version. I’m not sure all teams wore them (I know Hawks wore the Patty’s and the Cancer ones last season), but they all had versions made with their logo.